Matt Shepard named lead announcer for the Detroit Tigers. Matt Shepard has been a great part of the WEMU family, calling EMU football games for the last 18 seasons. Now, he just landed the broadcasting job of a lifetime--lead announcer for the Detroit Tigers on Fox Sports Detroit. Shepard talks all about his plans for the upcoming Tigers season, as well as the challenges he and his family have faced recently, with WEMU's David Fair. WEMU's David Fair talks to newly-announced Tigers announcer Matt Shepard. 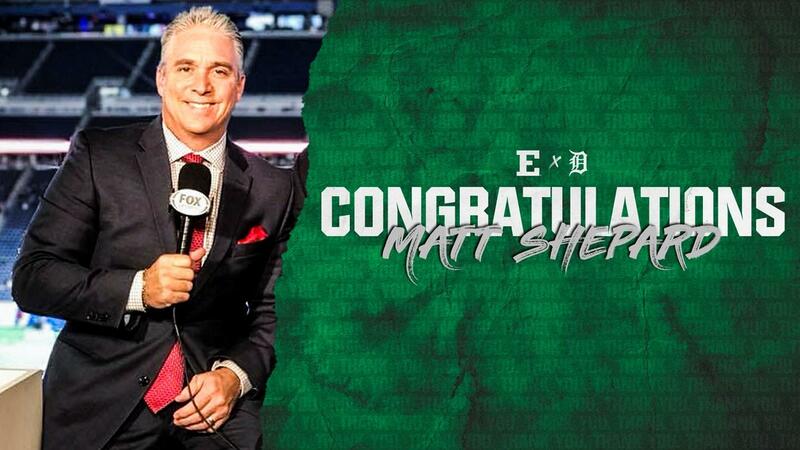 YPSILANTI, Mich. (EMUEagles.com) – The Eastern Michigan University Department of Athletics congratulates long-time football play-by-play voice Matt Shepard on being selected as the full-time announcer for the Detroit Tigers on Fox Sports Detroit. The 2018 season marked the 18th year that "Shep" called the action on the field for EMU on WEMU (89.1 FM). Shepard first handled EMU football play-by-play duties during the 1999 season. He returned in 2002 and held the post ever since. "We congratulate Matt Shepard for all his hard-work and are sincerely happy for him and his family for this new opportunity," said EMU Vice President/Director of Athletics Scott Wetherbee. "Our fans have been treated to many tremendous moments with Shep painting the picture on the field. Both he and analyst Rob Rubick are such a beloved parts of our football brand and the fabric of EMU gameday. We thank him for his tremendous service, professionalism, and passion." Labeled the "busiest voice in Michigan sports," Shepard was the 2018 recipient of the Detroit Sports Media's Ty Tyson Award for Excellence in Sports Broadcasting. B orn in Farmington Hills, Shepard is a two-time Emmy Award winner and two-times MSBA Michigan Sportscaster of the Year, on WDFN, Fox Sports Detroit, Big Ten Network and the Detroit Lions Television Network covering professional, collegiate and high school sports in the Michigan and elsewhere since the 1990s. "On a scale of 1 to 10, Shep is an 11," added EMU Head Football Coach Chris Creighton. He is incredibly talented, but what makes him special is that the cares. We will miss him big time, but wish him the absolute best." A nearly lifelong Michigan resident, Shepard graduated from North Farmington High. He played baseball at North Farmington and was a baseball team walk-on at Eastern Michigan before transferring to Central Michigan University for his junior and senior college years. At FSD, Shep has been a utility man doing everything from studio hosting, sideline and feature reporting, to play-by-play. He has called CCHA Hockey on Fox, Big Ten Network hockey, MHSAA championships (football and basketball), and numerous other exciting games. He worked at WWJ-AM Radio from 1993-2001 and has hosted radio shows on WDFN-AM 1130 dating back to 2001. Previously, he stepped in for Tigers, Pistons, and Red Wings play-by-play when asked to. Shep is also the longtime radio play-by-play voice of University of Michigan men's basketball and also calls the Detroit Lions preseason slate of games. Furthermore, his morning-drive sports talk show, "Shep, Shower 'N' Shave," is syndicated by Michigan Media Network and heard on locally WDFN and additional stations throughout Michigan. "All of us at WEMU congratulate Matt on this great new opportunity," said Molly Motherwell, WEMU General Manager. "We know he'll bring the same standard of excellence to the Tigers games that he applied to his football broadcasts. We'll miss both his passion and professionalism on the air and will always consider him part of the WEMU family. Replacing him won't be easy but we plan to launch a search soon." EMU football kicks off the 2019 season on the "surf turf" of Coastal Carolina University, Aug. 31, before heading to Lexington, Ky. to battle the University of Kentucky, Sept. 7. The Eagles then look for their third consecutive victory over a Big Ten Conference opponent, Sept. 14, with a visit to the University of Illinois. After three weeks on the road, the Eagles return home Saturday, Sept. 21, against Central Connecticut State University to open a new-look Rynearson Stadium. Patrick Campion sat down with Eastern Michigan University's Vice President and Director of Athletics, Scott Wetherbee, to talk about the current state of the Championship Building Plan, Athletics funding, and how they are moving forward without the $6 million gift announced by his predecessor, Heather Lyke. Patrick Campion sits down with EMU's Scott Wetherbee to get the latest on the Championship Building Plan and Athletics funding. Eastern Michigan University students, under the direction of Dr. Sadaf Ali and Patrick Campion, were given the opportunity to create a reporting project as a final project in their CTAT 334 class. This is the work of Alicia Schmidt, reporting on EMU's decision to cut several athletics programs earlier this year and how the student athletes involved in those programs were affected.